Clonezilla is a partition and disk imaging/cloning program similar to True Image® or Norton Ghost®. It helps you to do system deployment, bare metal backup and recovery. 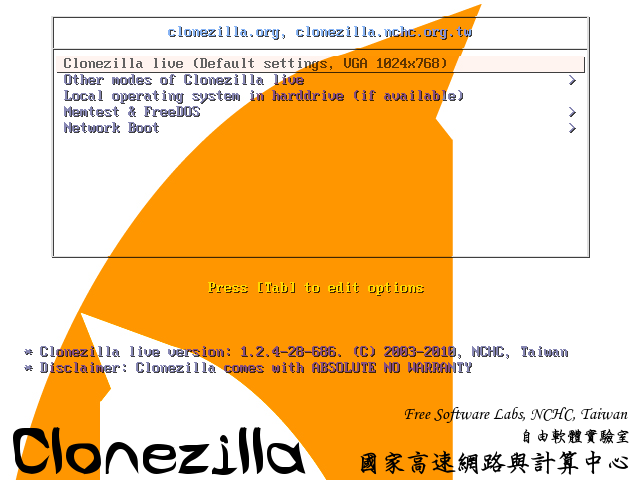 Two types of Clonezilla are available, Clonezilla live and Clonezilla SE (server edition). Clonezilla live is suitable for single machine backup and restore. While Clonezilla SE is for massive deployment, it can clone many (40 plus!) computers simultaneously. Clonezilla saves and restores only used blocks in the harddisk. This increases the clone efficiency. With some high-end hardware in a 42-node cluster, a multicast restoring at rate 8 GB/min was reported. Many File systems are supported: (1) ext2, ext3, ext4, reiserfs, reiser4, xfs, jfs, btrfs and f2fs of GNU/Linux, (2) FAT12, FAT16, FAT32, NTFS of MS Windows, (3) HFS+ of Mac OS, (4) UFS of FreeBSD, NetBSD, and OpenBSD, (5) minix of Minix, and (6) VMFS3 and VMFS5 of VMWare ESX. Therefore you can clone GNU/Linux, MS windows, Intel-based Mac OS, FreeBSD, NetBSD, OpenBSD, Minix, VMWare ESX and Chrome OS/Chromium OS, no matter it's 32-bit (x86) or 64-bit (x86-64) OS. For these file systems, only used blocks in partition are saved and restored. For unsupported file system, sector-to-sector copy is done by dd in Clonezilla. Due to the image format limitation, the image can not be explored or mounted. You can _NOT_ recovery single file from the image. However, you still have workaround to make it, read this. The underlying GNU/Linux operating system was upgraded. This release is based on the Debian Sid repository (as of 2018/Aug/16). Downgrade the Linux kernel to 4.16.16-2 due to an issue of Linux kernel 4.17 that accesses local device very slow. 5,393 11,319 Clonezilla <img src="https://www.oldergeeks.com/downloads/gallery/thumbs/wwwezilla.org.png"border="0"> Nov 16, 2018 - 11:58 2.5.6-22 239MB ISO , out of 26 Votes.